It’s hard to believe that 2015 has come and gone so quickly and now it’s time for the 6th Annual Pet Blogger Challenge. I first participated in this challenge in 2014 Pet Blogger Challenge after only 8 months blogging and then again for a second time in the 2015 Pet Blogger Challenge. If you are wondering what this is, it is a very cool challenge for pet bloggers to look back at where they have been throughout the year and look forward to where they are going. Many Pet Bloggers take part in this challenge so I invite you to follow some of the links at the bottom of this post to find some great new blogs to follow. I find it the best way to really get the feel of some great people, it’s also a way to make some great new friends. So without further ado… here we go! I have been blogging since May 2013. I started Oh My Shih Tzu as a way to deal with a dog that suffered with Canine Cognitive Dysfunction. It has now evolved into a blog about my Shih Tzu Riley and her love of dog sports! If you always thought that Shih Tzus were just couch potatoes and stubborn as heck I am out to prove that little dogs, especially Shih Tzus can be just as competitive as other dogs in sports. 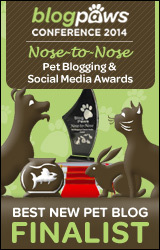 I was proud to be nominated for a second year in a row for a 2015 Blog Paws Nose-to-Nose Award! This year I was nominated for Best Pet Blog Photo. Though I didn’t win, it is such an honor to be nominated. This year my favorite blog post was Confession of a 40 Something Pet Parent. After much controversy from a Mommy Blogger about how pets don’t make people parents and that she couldn’t stand the comparison I had to make my own stand. Though my blog post didn’t go viral, I know a lot of people were able to relate to me and my situation. Even today as I look back and read it tears come to my eyes… just because they can’t talk back, well that is up for debate, my “kids” are the world to me, and being a parent is more than just a biological thing…. because I’ve realized in the times we currently live in not many parents actually “parent”. The most popular post on my blog this year was Cancer in Dogs: 8 Signs it Can Happen to You . We always think things happen to others until it finally happens to us. I think this was a very popular post due to obvious reasons. My Kid Has Paws is a blog that I read almost all the time. I tend to jump around a lot, but MKHP is so informative. Written by my friend Rachel Sheppard it is truly one-of-a-kind! I especially am looking forward to a new series of monthly challenges she will be doing! Don’t feel pressured. Recently I haven’t been posting a lot. I have been writing a lot, but not publishing. For some reason I was putting this pressure on myself to blog … when really there has been no reason not to. This great piece of advice was given to me by my friend and fellow blogger Susan from Life with Dogs and Cats. Well I’m excited to say that we now have a new addition to our family since January 7th! So we will be adding a whole new series about raising a Shih Tzu puppy and turning that puppy into an agility champion. Yes we have high hopes for this little guy! We will continue to participate in a ton of fun dog sport trials. I would really like to restart my Check the 8 on 8! It’s a monthly reminder to check your female dogs and cats for breast cancer. We will be restarting in February and I would really like everyone to join in! You can participate with Posts, Tweets, Pins or even Instagram pics! Be sure to check out some of the great Bloggers below recapping their 2015’s!!! I can’t wait to read more about your puppy…. and see the pictures. Squee! It’s been great getting to know you these past few years and I can’t wait to see where you take the blog. I love the Check the 8 on 8 challenge I’ll be looking forward to that starting again. I SO ENJOY YOUR POSTS AND ALL YOUR ADVENTURES WITH RILEY. KEEP UP THE GOOD WORK AND HAVE A GREAT 2016!!!!!!! Congratulations on the new puppy! I hope those first few days home went well. I’m hoping to get better with my photography and even signed up for a class this semester. All the best to you in2016! I love your advice about not putting pressure on yourself when it comes to blogging. It’s usually pretty obvious when I’m reading a blog post that’s been thrown together on the fly for the sake of being there – rather than the ones that have some passion behind ’em. Aha – kindred spirits with a love of photography. PAWhaps when I get my new camera I can DM you with questions. LOL I enjoy reading your blog and reading this post was somewhat like sitting down talking to you over a good glass of wine. Nice job! I really like your advice to not put pressure on yourself. It should be enjoyable and not a source of stress. I love that most of the other bloggers in the challenge also feel the same way. Congrats on your nominations this year and here’s to a great 2016!